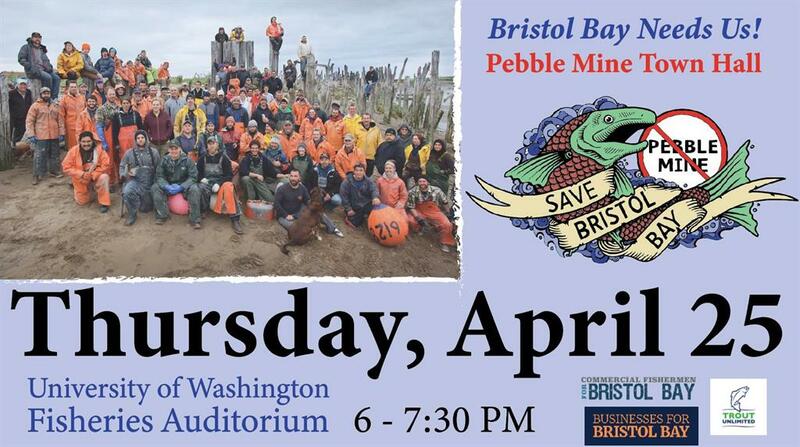 Come to a Town Hall meeting to learn about what's happening regarding the proposed Pebble Mine in the headwaters of important salmon-bearing streams that feed into Bristol Bay. The meeting will take place at the University of Washington Fisheries Auditorium from 6:00 to 7:30 pm on Thursday, April 25. Hope to see you there! Come and hear representatives from WDFW and Seattle Public Utilities discuss the reasons for the collapse of the sockeye runs in Lake Washington. There has not been a recreational fishery for sockeye in Lake Washington since 2006, despite the completion of a large sockeye hatchery on the Cedar River. This is an opportunity to hear the experts talk about the possible reasons for the dismal run size and possible future solutions. The meeting will be held at the Red Lion Hotel on Grady Way in Renton, Tuesday April 23 beginning at 7:00 pm. Hope to see you there! Our featured speaker for the the May meeting will be John McMillan, Science Director for TU's Wild Steelhead Initiative. John will be talking about the recovery of the Elwha River following removal of the dams a few years ago. John is an extremely knowledgable fisheries scientist and steelhead fisherman, so his presentations are always very informative. In addition, there will be the usual project updates, fishing stores, raffles, good food and brew. Come and join us to see what your favorite chapter is doing. The meeting will be help at 7:00 pm at the Rogue Ales Brewhouse at 35 W Sunset way in Issaquah. Our chapter is working with several governmental and non-governmental agencies and organizations to restore the last remaining native run of kokanee salmon in Lake Samammish. There is always a need for volunteers for kokanee-related projects. For more information on events and projects that we are working on go to - Lake Sammamish kokanee. Here's a live camera view of Kokanee returning to spawn. Just click here. The Kokanee Work Group (KWG) is an ad hoc group formed in 2007 to investigate the causes of the decline of kokanee within Lake Sammamish. For more information on KWG, go here. Sponsor showing of Fly Fishing Film tour movies. Volunteers are needed in order to make these activities successful. Come to the monthly meetings to learn more about these activities and how/when to volunteer! People joining Trout Unlimited for the first time, can join at a reduced rate of only $17.50. For more information and to sign up, click here. If you shop at Fred Meyer, you can sign up at the Community Rewards Program. Just provide your Fred Meyer card number (not a credit card) or the alternate ID you use to get their reward and fuel points. You will be asked for the number of the organization that you want to support. Use 91163 for our chapter. To learn about this project and how it can affect the Kokanee in Lake Sammamish, click here. Nils Cowan, who works for KCTS television on the EarthFix program, has written an article and produced a video about the Urban Wildlife Refuge Partnership. To read his article and see the video, click here. Board Meetings are held on the first Wednesday of the month. At the board meetings, business of the chapter is discussed including budgets, projects, outings and spending items. All members are invited to attend. Meeting time is 7:00 pm and the location is the Rogue Ales Brewhouse in Issaquah. You can follow your chapter on Facebook! Just click here. Here's an article in the Bellevue Reporter about Kokanee in Lake Sammamish. Read the article. The proposed Maple Valley asphalt plant may be coming closer to reality. Read this article. Chemicals from tires are suspected in causing deaths of Coho Salmon in Puget Sound area streams. Here's a good article about experimental work being done to establish a sustainable fishery in Morro Bay, California. To read the article, click here. Here's an article about the evidence of climate change on the Big Hole River in Montana. To read the article, click here. Here's an article in the Bellevue Reporter about the low returns of Kokanee in Lake Sammamish. To read the article, click here. Chris Wood, President and CEO of Trout Unlimited has responded to President Trump's decision to withdraw from the Paris Climate Change Agreement. To read his response, click here. National monuments to be reviewed per President Trump executive order. For more information, click here. Here's a great article in the Issaquah Reporter about the Kokanee fry release ceremony at Confluence Park in Issaquah. To read, click here. .Our chapter is a member of the Kokanee Work Group (KWG), a collaborative group trying to identify the causes of the decline of native Kokanee in Lake Sammamish. To see what the KWG is doing , click here. David Kyle, along with Chris Gregerson from King County have installed Remote Stream Incubators on Zackuse and Idylwood Creeks. To read David's summary of this project, click here. Here's an article and video about the urban wildlife refuge being created at Lake Sammamish that will benefit the little red fish. To read, click here. The 9th Circuit Court of Appeals has ruled that the State of Washington must remove or repair culverts that are blocking fish passage. To see what culverts in our area are involved, click here. For information on TU's Wild Steelhead Initiative, click here. The design for the Steelhead license plate is complete and the plates can be purchased beginning in January of 2017. For more information, click here. Here's a great op-ed by John Luthanen from the North Sound chapter of TU regarding a wild steelhead fishery on the Skagit River. To read, click here. Watch a video named Chrome that talks about the looming threats of climate change and ocean acidification on the survival of steelhead. Click here. Watch this King 5 video about the work being done by the USGS to determine the possible role of parasites on steelhead survival. Click here.